I am a team member leading an online Summer Book Study on finding your God-given vocation. If you’ve ever thought God had something special in store for you, but you didn’t know how to find out what, or have any clue how to get started, start with us! 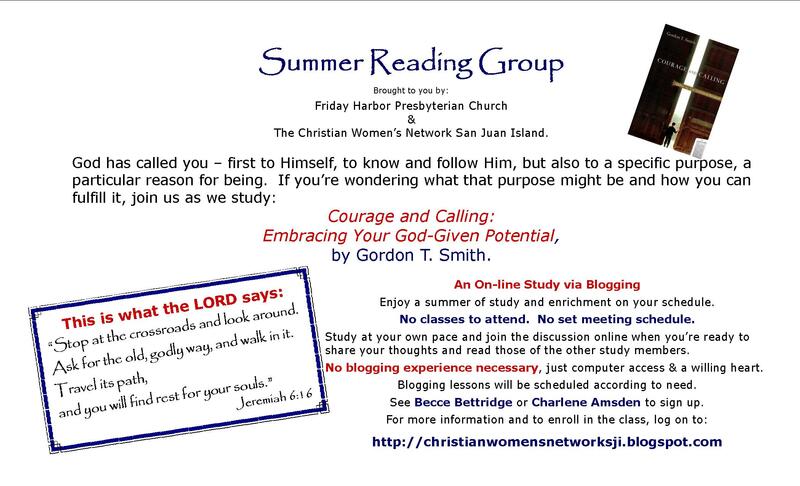 For more information, visit Christian Women’s Network, SJI — and men, you’re invited, too. Just because CWNSJI is letting us use their website, doesn’t mean we’re excluding you fellas. Quilly, this sounds intriguing. I have a friend coming over today and we’re looking for something to do over the summer that keeps us in the word…I’ll show her the site! Thanks! Kelley — you and your friend are more than welcome to join us. Tilden – -we’d love to have you! Tilden — I wish I had thought of Kindle. My book just arrived today. I was getting worried that the class would start and I still wouldn’t have my own copy! The PC kindle rocks or the book? Have you been to the website to check out our time line? My book — paperback — arrived today. Whew! I will be able to help facilitate with the class. the kindle for pc rocks! without ever having to leave my chair. oh and the whole process took about a minute and a half! Can you highlight and annotate? I just bought “With the Word” on my Kindle. I hope they don’t rescind it like they’ve done so many of their other books.